Weed out volunteers, perennials and winter annuals. Pre-seed is a profitable time to control weeds ahead of canola. Seed right the first time. Uniform canola crops with 7 to 10 plants per sq ft can yield more and have lower protection costs. Knock off clubrooty mud. Moist soil clinging to field equipment can spread clubroot quickly. Warm up binned canola. 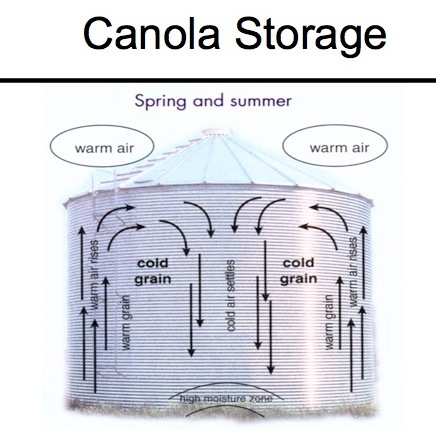 Canola to be stored through summer will be safer if warmed up now to 5-10°C. This will break up moisture movement cycles within the bin. 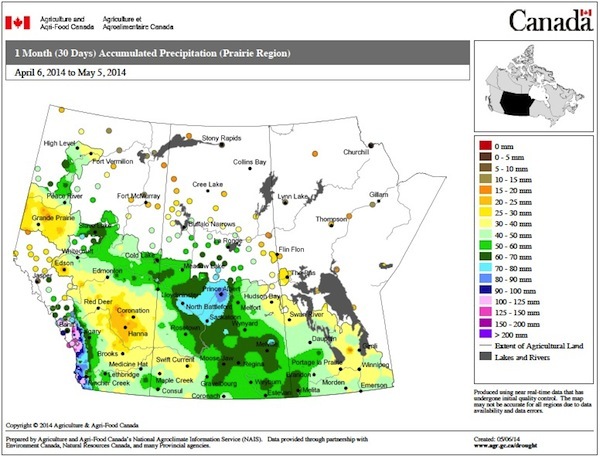 This map shows accummulated moisture across the Prairies for the 30 days from April 6 to May 5. Topsoil moisture is generally good across the Prairies. Moist soil is more likely to get picked up by seeding and spraying equipment and carried field to field, spreading clubroot as well as other diseases and weed seeds and whatever else might be in that soil. You can create your own current and historic weather maps at this AAFC site. 1. One gram of soil, less a sugar cube’s worth, from a heavily clubroot-infested field could have how many clubroot spores? 2. Considering the answer to question 1, how many canola plants could be infected with clubroot if that one gram of heavily infested soil was sprinkled over an entire acre? 3. Seeding was later than average across the Prairies in 2013, with significant progress made in the last 10 days in May. Alberta was ahead of the pack, with 60% of canola seeded by May 21, 2013. Manitoba was around 50%. Curiously, what percentage of intended canola acres were seeded in Saskatchewan at that time? 4. What was the average canola yield across the Prairies in 2013? Research shows that a pre-seed burnoff will result in higher yields versus no pre-seed burnoff. Walk fields to see what weeds are present and how fast they’re advancing. Seeding can begin fairly soon after a burnoff. 1. Consistent canola seed placement at a uniform depth improves seed survival and the return on seed investment. 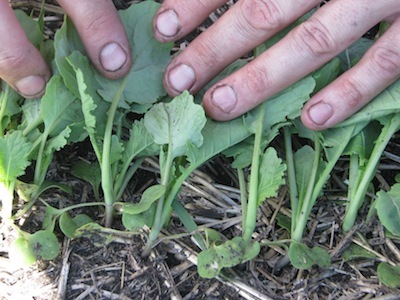 Canola with a minimum of 4 to 6 plants per square foot gives the crop a better chance to meet its yield potential. 2. A denser faster-canopying crop can eliminate the need for a second in-crop herbicide application. 3. A stand of 6 to 8 plants per square foot leaves growers a little leeway when it comes to disease and insect management decisions, knowing that losing a plant or two per square foot will not reduce yield potential. 4. A uniform plant stand of 6 to 8 plants per square foot could mature faster than a thinner stand, which will branch out more. The more branches, the longer it takes for all seeds to mature. Moist seed conditions mean more soil clinging to drills and tractor and sprayer wheels. This increases the risk of moving clubroot as well as weed seeds and insect pupae around the farm. With the discovery of a potential new clubroot pathotype, growers will want to take time to sanitize equipment between fields. Canola profits tend to benefit most from a nutrition plan that includes nitrogen, sulphur and some seed-placed phosphate. But what about potassium? Or micros? The Canola Council of Canada’s Ultimate Canola Challenge (UCC) will continue for 2014, with 15 sites across the Prairies. UCC will include many of the same comparisons as 2013, looking at various micronutrient treatments to see how they stack up against best management practices using N, P and S.